For more info regarding OneDrive, such as how to copy, move, save, view and share files, refer to Microsoft's support article. Windows® can automatically back up device content to OneDrive including settings, app list, photos, videos, and messages. To utilize the backup functionality, the device must be signed in with a Microsoft account and there must be sufficient space in OneDrive to store the data. From the Home screen, navigate: All apps icon (located in the upper-left) > Windows System > File Explorer. 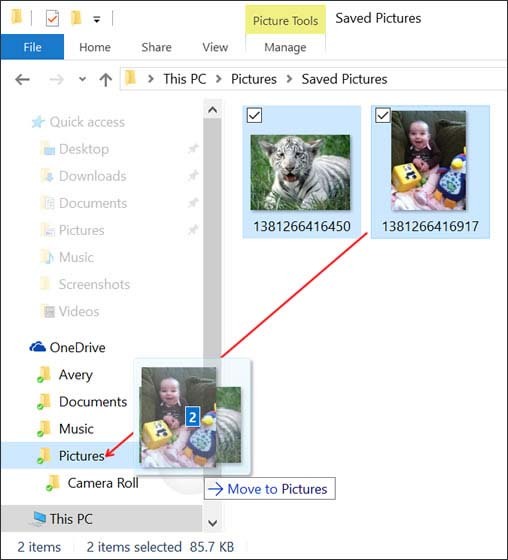 Locate the file(s) you'd like to add then drag and drop into a desired OneDrive folder (located in the left-pane), then tap or click Copy here. The version on your PC is out of sync.